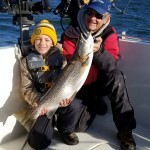 Lake Ontario Trout and Salmon…, The Oswego Rules! One of many browns, plus rainbows and salmon boated in and around Oswego Harvbor on 5/11/18. There are a lot of ports along New York State’s Lake Ontario shoreline where trout and salmon are caught in the spring, but it’s tough to beat fishing out of the port of Oswego. Second largest tributary emptying into the lake, the Oswego River and it’s warm, rich plume that impacts several miles of the lake’s shoreline is a magnet to baitfish, alewives, and, following, them, predators…, trout and salmon. Last time the Fish Doctor was out deep in 150 fow, offshore surface temp was 38.5 degrees. Inshore, surface temp in Oswego Harbor was in the mid50s. Today, in 60 fow surface temp was 40 degrees and harbor temp was 60 degrees. Browns and salmon we boated were stuffed with alewives. 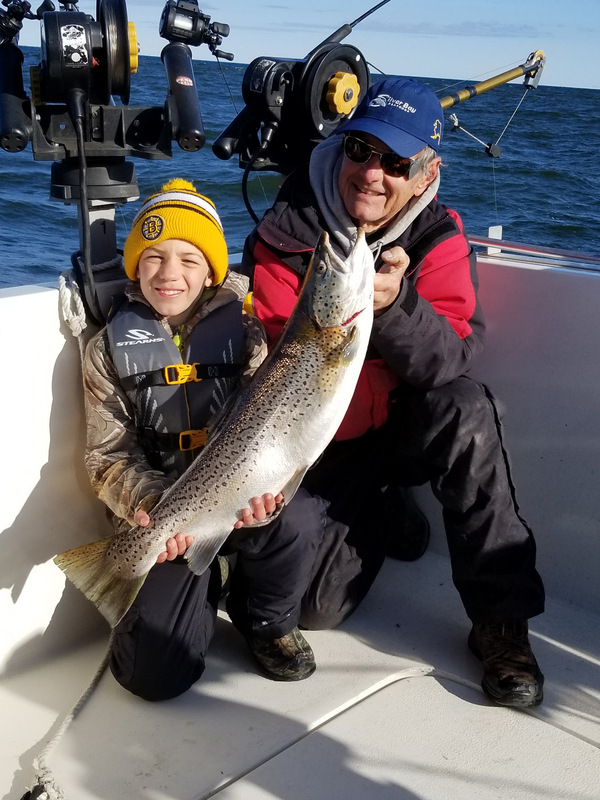 In a tough NE wind, it was too bumpy to fish the main lake, so every boat out of Oswego fished in and around the harbor, boating browns, rainbows, Atlantics and a few kings. Elsewhere on the south shore of the lake from the Niagara River to the Salmon River it was either impossible to troll or very, very lumpy. No wonder Fish Doctor anglers say, “The Oswego Rules”!